I make custom Chainmaile & Scale maile , as well as a wide verity of hand crafted unique Jewelry , Armor , Cosplay Accessories and other creative arts . Most items listed here are made from light weight bright aluminum and anodized ( colored ) aluminum . For any orders on other metals please contact me. I also offer Priority Express options that are costly but will speed up processing and shipping , keep in mind that all items not already made take time to make , please contact for special request . I pride myself on perfection as an artisan so all items are very well made and made with care . 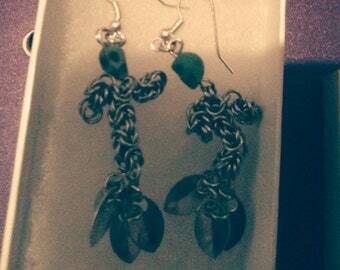 Beautiful Green And Silver Celtic Tree Pendant on a Handmade Chainmaile Byzintine Weave Chain . 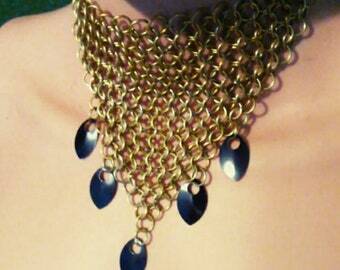 Handmade Chainmaile Crop top . Belly Dance hand made Chainmaile earrings with gold gypsy coins. Red and Black Dragon Scalemaile Hand flower. Pink and Blue Dragon Scalemaile Hand flower. Pink and Gold Dragon Scalemaile Hand flower. Purple and Black Dragon Scalemaile Hand flower. Kids ribbon and Chainmaile bracelets . Light Purple and Black hand made black gem spider earrings . Hand made Chainmaile assorted spiritual Stone pouches . Gorgeous Celtic Tree of life Stainless Steel with Red Stones Pendant , on a Handmade byzantine weave necklace. Hand made Scalemaile costume glove set . Norse Wolf / Fenrir pendant on Stainless steel half Persian 3in1 weave hand made necklace . Three piece warrior outfit , coif, top , and skirt with leather belt and leather straps. The Dragon Scalemaile Veil is a beautifully done piece. 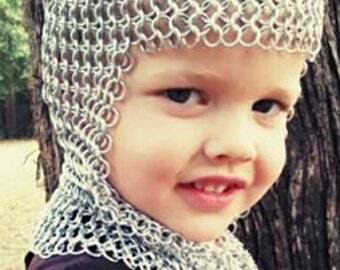 It's high quality chainmail which looks intriguing when wearing it. The owner is very courteous and quick to respond to emails. The veil was shipped out quickly in time for a film production. New option for nylon cord, we now have stretchy straps that come in lots of colors please ask upon order. Closed coif with red trim. Keep in mind hand crafted items take time and are made with love and care . Please contact for rush orders! Vending at the 2019 Gulf Coast Renissance and Pirate Festival. My shop still offers Chandra Cosplay Chainmaile shirts , please contact me for more information . Special events ? Please contact me for a special custom piece , just suited for your event . I first saw chainmail being made by a friend we called Flea , he was our room mate and taught us some basics . Then about 3 years later we ran into a guy that got us truly started , sadly he is no longer here in this area but we still give him credit for helping us all out. You will see in the pics that we do events the ones you will see listed above are Pensacon and Gulf Coast Renaissance Fair . We are huge supporters of the local events listed above and we would like for you to check out the websites of Pensacon and Gulf Coast Renaissance Fair here are the links ( http://www.pensacon.com/ and http://www.yesteadyhands.com/GulfCoastRenaissanceFaire ) Thank you ! We are all hard workers and do our best on all the items you see listed in the shop. We are picky about our rings to insure that they are all in great shape and their are no weak links. All the items you see made from chainmail are all hand crafted and most of the bright aluminum wire is hand run into coils and hand clipped , this takes a very long time and the weaves you see are not simple they are all complex and take some time to complete. We always insure that our work is done right and will fit and be as comfortable as possible. Check out True Detective, Season 2 Episode 3... One of the main characters, played by Vince Vaughn, goes to the set of some kind of "post apocalyptic revenge flick" and our outfits are on 2 of the actresses playing actresses... We are now in an HBO series! Also special thanks to photography shops ( https://www.facebook.com/WhiskeyandRyePhotography , https://www.facebook.com/lawrence.munne?fref=pb&hc_location=friends_tab ) You will find a Red Sonja cosplay here and then a coin top for the second page . Owner ) ( Angel ) Often at the Gulf Coast Renaissance Fair you can find me dressed as an elf selling chainmail that I and the others made by hand . Also Mother to two Beautiful Girls and a little Boy. Bekka our sister and apprentice passed away 07-7-17 she is and will be missed ... Lost but never forgotten . This is my future husband and assistant in the shop . He is a skilled welder and Forman at Breeze Boat Lifts . So he will be putting his talents to work with other metal works and future smith work . 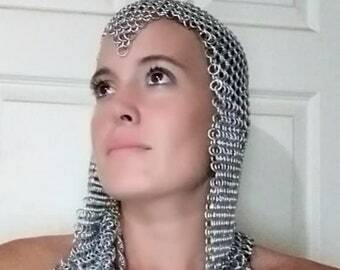 I make custom chainmail as well as a wide verity of hand crafted unique Jewelry , Armor , Cosplay Accessories and other creative arts . Most items listed here are made from light weight bright aluminum and anodized ( colored ) aluminum . For any orders on other metals please contact me . All of my items carry a lifetime warranty. Simply contact me through either this shop, our email address (celestialchainmail@yahoo.com) or my Facebook fan page, and send the damaged item back. I will repair or replace the item as necessary, and ship it back to you. I WILL refund the cost of shipping the item to me, but only if a receipt showing the cost is included with the item. Orders may be cancelled within 48 hours of from the original purchase without penalty for a full refund. After that deadline, I have a very limited refund policy, there are no full refunds. In very rare circumstances I may refund part of the cost if the item is returned in untarnished or unworn condition. I accept credit/debit cards and Paypal. Orders may be cancelled within 48 hours of original purchase for full refund. I ship all items USPS Priority Mail 6-10 day shipping for International . This is to ensure that the orders reach their destination and can be tracked by the customer. I ship all items out of Ft Walton Beach FL. If you order an item that is in stock, it ships within 1-7 business days. Custom orders WILL take longer, depending on the item in question. An estimate on the time to create and ship an item will be given along with a price quote for custom items. I welcome custom orders for any chainmail or scalemail item. I can work out of standard aluminum, bright aluminum, stainless steel, titanium and other materials. I can make custom armor please contact for details . I also make bikini tops, bottoms, club wear, basically anything wearable you can think of made out of chainmail or scalemail and I will make it as long as I have the proper measurements. TIME ON CUSTOM ORDERS : I do have to place orders for materials and hand weave items this means it takes time . Large items such as shirts and full armor and armor pieces may take months to complete , also if I have other orders in line and I do not have the items already made this will take some time and I will get to you as soon as possible. Always contact me and see where you are in line. Small items such as jewelry , pouches, key chains and knickknacks will not take but a few weeks and if you are in line behind a big order and I do not have the item you ordered in stock you can contact me to find out where you are in line and if you need this item soon .